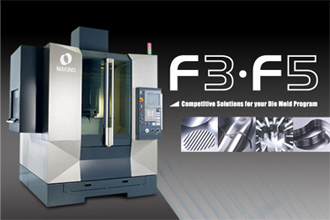 The Makino F-series is the right answer to challenging demands on efficiency and competitive solutions. Developed for the medium to higher end Die Mold market, F-series provide solutions for the majority of the Die Mold Industries like Precision Plastic Mold, Die Casting, and Forging Die. Improved performance in applications includes Core, Cavity, Electrode making, and Fine 3D machining. Makino’s commitment to total quality for exceptional results can be seen in extensive developments in Spindle Technology, Motion Technology, and machine building. Makino’s Invention of under race cooling* of spindle bearing shows remarkable improvement in increasing bearing life by more than 200% over conventional type. The highly balanced system also reduces vibration. The results are longer tool life of up to 30% and higher quality finish resulting in the elimination or reduction of polishing time. Another key technology is Makino’s development of Super Geometric Intelligence (SGI) which allows high-speed NC data processing with accurate profile control. This provides a high-quality surface finish with a shorter cycle time of up to 30% (depends on N.C. data) as well as good control of parting lines and elimination of flashes in mold parts. Machine building establishment of geometric accuracies of X, Y and Z axes through scrapping, against the general practice of electronic error compensation means that the motion elements last longer due to their natural alignment. Machines retain sustainable high accuracy due to low wear and tear. With twice the mechanical structure rigidity, F-series maintains a highly rigid mechanical structure that is ideal for precision die mold machining.